Recipients have been farmers who have been actively involved in statewide agricultural organizations and provided leadership in a variety of ways. Recipients have also included agribusiness people who have worked to change the industry through advanced marketing plans or business management tools for the industry. Lastly, recipients include career employees who have been extraordinary in moving the industry forward. The award is presented to the winner at the Society's Annual Gala each spring. ​​Chances are whenever a major agricultural issue confronts New Jersey farmers, either Tom or Jane Brodhecker are at the forefront advocating on behalf of New Jersey agriculture industry’s interests. While Tom and Jane originally hailed from Indiana, New Jersey has been fortunate to have benefited from their choice to move to our state in 1966. Born in Indiana, Tom received a Bachelor of Science degree in Business Marketing and Journalism from Indiana University in 1957. He later went into the US Air Force, trained and earned the rating of command pilot, which prepared him to eventually become a commercial pilot for Pan American Airways; a career that lasted till the 1990’s. Jane also graduated from Indiana University with a degree in Home Economics and Nursing with minors in arts and math. When she met and married Tom, she spent 10 years as an “Air Force” wife, and along the way helped raise six children. In 1969, the Brodheckers purchased their farm in Hampton Township, Sussex County. The farm began as a grain, hay, sheep and cattle operation and has grown in size and diversity. Today, Brodhecker Farm continues to grow grain and hay on their own land as well as rented land. They continue to raise cattle and sheep and have also expanded their operations to include selling livestock feed, as well as a full range of farm supplies and farm machinery. Tom and Jane have been long-time members and leaders of the Farm Bureau, both at the county and state level, attending state and national conventions. Additionally, Jane has been a long-time member and leader of the Farm Bureau Woman’s Committee. She has also found time to volunteer with 4-H and the Girl Scouts while managing their farm’s business office! Tom and Jane have served in leadership positions on their county board of agriculture and have also served on numerous committees and boards that include State and Regional 4-H Leaders Forum Planning Committees, New Jersey Agricultural Experiment Station Board of Managers, Sussex County Farm and Horse Show, Members of the Sussex County Agricultural Development Board, delegates to the NJ State Agriculture Convention - just to name a few. Tom served with distinction, on the New Jersey State Board of Agriculture and completed his tenure by serving as the Board’s President. Jane has been a long-time member of the State Agricultural Development Committee where her expertise and contributions have helped resolve challenges facing New Jersey’s agricultural industry. In addition to raising six children, Tom and Jane are proud grandparents of thirteen grandchildren and one great-grandchild. 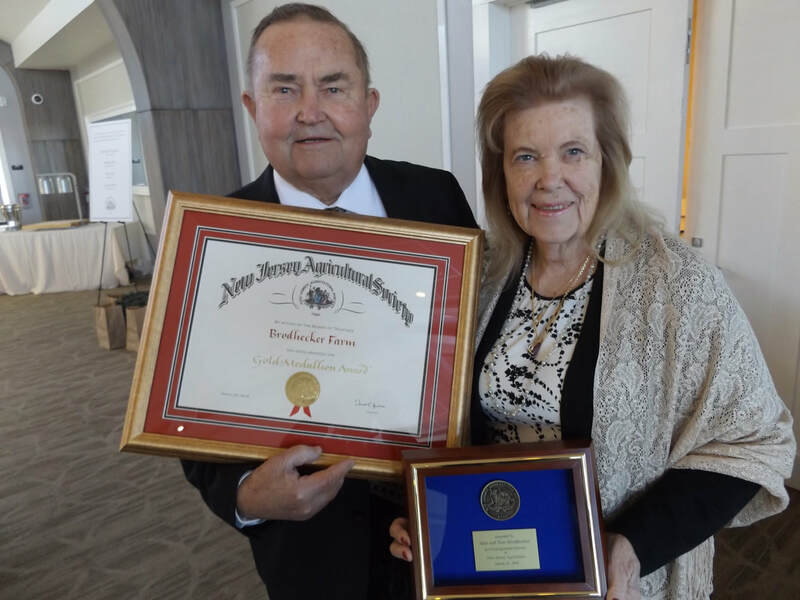 The New Jersey Agricultural Society is proud to honor Tom and Jane Brodhecker’s lifetime achievements within New Jersey’s agricultural industry and salute them for their efforts and devotion to help further agriculture’s interests. 1987 - Lester C. Jones, Sr.
1988 - James P. Vreeland, Sr.
1990 - Walter Ellis, Jr.
1991 - William S. Haines, Sr.
​1998 - Raymond L. Blew, Jr.
1999 - William H. Pettit, Sr.
2000 - Arthur R. Brown, Jr.
2002 - Edward Wuillermin, Sr.
​2016 - John Rigolizzo, Jr.